For generations, a great wedding cake has been the centerpiece of every wedding catering menu. Guests always look forward to a delicious dessert following a beautiful ceremony and exciting reception party, and a great wedding cake will make your event even more memorable. You and your guests deserve some delicious cake, but how do you choose the right one? Well, the wedding pros at De Luxe Banquet Hall are here to help with some useful tips and advice on how to craft the perfect wedding cake. Read on for a guide through the cake planning process. The first part of any wedding planning process is to determine your budget. 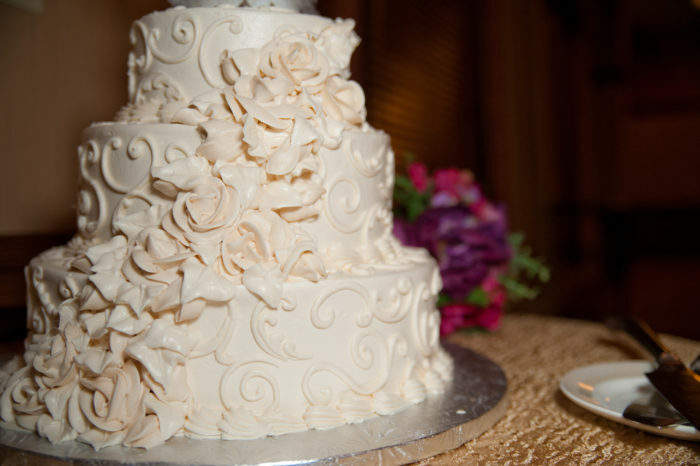 Be sure to consider all aspects of your wedding to determine how much you can afford to spend on your wedding cake. Remember, you need to budget for the cost of the cake as well as cake transportation to your wedding venue. Wedding cakes are typically priced per slice, and you should plan to pay anywhere between $4 and $15 per slice per guest. Before meeting with wedding cake bakers, it’s worth sitting down with your spouse to think about what kind of cake you want. Do you want a simple, classy wedding cake? Or would you like a gigantic, decadent creation? What sorts of flavors do you want to incorporate in your cake? You should have a general idea of what you’re looking for before meeting with any cake vendors. You need to find a great wedding cake, and in order to find the best cake you should meet with multiple wedding cake vendors. Scheduling and attending multiple meetings might seem like a hassle, but it will give you a great sense of the options available for your wedding. And having a variety of options will help you find the perfect wedding cake for a great price. If you’re having trouble finding leads for your wedding cake, consider asking friends and family for some advice. There’s likely someone in your inner circle who’s had or attended a great wedding recently, and they can probably connect you with a great cake vendor. Your wedding cake can’t just taste great. It needs to look great too, which is why you should find a beautiful cake topper for your dessert. Cake toppers are a wedding tradition, and can be anything from the classic bride/groom figures to colorful flowers and more. And if you’re looking to save some money, you can always craft your own DIY wedding cake topper. Creating the perfect wedding cake is a difficult task, relying on the skills of a great baker and a hearty helping of your own ideas. But with a thoughtful, measured approached, you’ll definitely have an impressive cake for your event. And if you’re looking for a wedding venue in Los Angeles, you should definitely consider De Luxe Banquet Hall. Our event venue offers beautiful decor and exceptional accommodations perfect for wedding receptions, engagement parties, anniversary celebrations, and more. Contact De Luxe Banquet Hall today for more information on booking and availability.